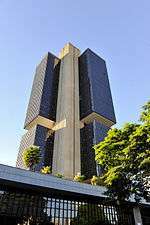 The Central Bank of Brazil (Portuguese: Banco Central do Brasil) is Brazil's central bank. It was established on December 31, 1964. The Central Bank is linked with the Ministry of Finance. Like other central banks, the Brazilian central bank is the principal monetary authority of the country. It received this authority when it was founded by three different institutions: the Bureau of Currency and Credit (SUMOC), the Bank of Brazil (BB), and the National Treasury. One of the main instruments of Brazil's monetary policy is the Banco Central do Brasil's overnight rate, called the SELIC rate. The Bank is active in promoting financial inclusion policy and is a leading member of the Alliance for Financial Inclusion. It is also one of the original 17 regulatory institutions to make specific national commitments to financial inclusion under the Maya Declaration during the 2011 Global Policy Forum in Mexico. Henrique Meirelles - 01/01/2003 - 31/12/2010. Arminio Fraga - 03/04/1999 - 01/01/2003.